Peripheral T cells encounter rapid decrease in oxygen tension because they are activated by Ag recognition and migrate into inflammatory sites or tumors. Activated T cells, therefore, are thought to have such machineries that enable them to adapt to hypoxic conditions and execute immune regulation in situ. We have recently shown that survival of CD3-engaged human peripheral blood T cells is prolonged under hypoxic conditions and hypoxia-inducible factor-1 (HIF-1) and its target gene product adrenomedullin play a critical role for the process. It is also shown that hypoxia alone is not sufficient, but TCR-mediated signal is required for accumulation of HIF-1α in human peripheral T cells. In the present study, we showed that TCR engagement does not influence hypoxia-dependent stabilization but stimulates protein synthesis of HIF-1α, most possibly via PI3K/mammalian target of rapamycin system, and that expression of HIF-1α and its target genes is blocked by treatment with rapamycin. Since some of those gene products, e.g., glucose transporters and phosphoglycerokinase, are considered to be essential for glycolysis and energy production under hypoxic conditions and adequate immune reaction in T cells, this TCR-mediated synthesis of HIF-1α may play a pivotal role in peripheral immune response. Taken together, our results may highlight a novel aspect of downstream signal from Ag recognition by TCR and a unique pharmacological role of rapamycin as well. Immune cells encounter rapid changes in oxygen tension as they develop and migrate into different compartments of the body (1). Especially peripheral T cells are activated by Ag recognition in inflammatory sites or in tumor, both of which are known to be hypoxic (2). Hypoxic environment is generally considered to be disadvantageous for cellular energy production and survival. It, therefore, appears to be rather paradoxical that activated T cells consume energy to synthesize adhesion molecules and cytokines and perform various functions including adhesion, migration, prolongation of survival and proliferation, cytokine secretion, and cytotoxicity (3). Given this, activated T cells should have such machineries that enable them to adapt for changes in oxygen tension and execute these functions in situ. The transcription factor hypoxia-inducible factor-1 (HIF-1)3 is generally believed to be a central regulator of the cellular response to hypoxia (4, 5). HIF-1 induces expression of the genes essential for adaptation to hypoxia including those for erythropoietin, glucose transporters, glycolytic enzymes, and vascular endothelial growth factor (VEGF), eliciting successful homeostatic regulation under hypoxic conditions. Moreover, genetic studies have clearly indicated the essential role of HIF-1α in regulation of inflammation and immune system. For example, genetic disruption of HIF-1α resulted in abnormal B cell development and autoimmunity (6), and selective deletion of HIF-1α gene in granulocytes and macrophages/monocytes was shown to lead to impairment of inflammatory responses such as motility, invasiveness, and bacterial killing of those cells in mice (7). HIF-1 consists of two distinct basic helix-loop-helix PAS (Per/Arnt/Sim) transcription factors, HIF-1α and HIF-1β. HIF-1α is sensitive to oxygen levels, and, under normoxic conditions, several proline residues are hydroxylated by distinct prolyl hydroxylases and rapidly degraded via ubiquitin-proteasome pathway (4). However, under hypoxic conditions, HIF-1α subunit is stabilized and translocates into the nucleus, thereby homodimerizing with HIF-1β and binding to hypoxia-response element (HRE) DNA sequence on the promoter region of HIF-1 target genes to activate their transcription (8). In addition to this hypoxia-dependent mechanism, recent studies have demonstrated non-hypoxic pathways for regulation of HIF-1α activity (9, 10) and multiple regulatory mechanisms of HIF-1α protein level, may enable cells to adapt to diverse alteration of environments and preserve homeostasis in a tissue-dependent manner. For example, receptor-mediated regulation of HIF-1α expression is thought to be cell and signal specific, and a number of reports have suggested that receptor-mediated factors such as growth factors, hormones, and cytokines induce HIF-1α protein expression through various signalings including PI3K/mammalian target of rapamycin (mTOR) pathway (11, 12, 13, 14, 15). Rapamycin is an immunosuppressive agent clinically approved for use in kidney transplant patients and additional applications are being considered in autoimmune and chronic inflammatory diseases (16). Rapamycin binds to FK506-binding protein 12, and this complex targets mTOR and inhibits T cell response to IL-2 to progress G1 to S phase (17). On the other hand, it has been noticed that rapamycin suppresses the growth of certain tumors (18, 19). For example, rapamycin inhibits metastatic tumor growth and angiogenesis in mouse model and this anti-angiogenic activity is shown to link to a decrease in production of VEGF (20). Furthermore, Majumder et al. (21) have clearly indicated that the anti-tumor effect of rapamycin is, at least in part, mediated by inhibition of mTOR-dependent HIF-1α expression using Akt-dependent prostate intraepithelial neoplasia. We have recently shown that survival of CD3-engaged human peripheral blood T cells is prolonged under hypoxic conditions, and that HIF-1 and its target gene product adrenomedullin (ADM) play a critical role in the process. Interestingly, it is also shown that hypoxia alone is not sufficient but additional TCR-mediated signal is required for sufficient accumulation of HIF-1α in human peripheral T cells (22). However, underlying mechanisms of TCR-dependent HIF-1α accumulation in human peripheral T cells remain unclear. In the present study, we demonstrated that Ab-mediated TCR engagement does not influence hypoxia-dependent stabilization but stimulates protein synthesis of HIF-1α, most possibly via PI3K/mTOR system, in peripheral blood T cells. Moreover, expression of HIF-1α and its target gene expression was blocked by treatment with rapamycin. Taken together, our results may highlight a novel aspect of downstream signal from Ag recognition by TCR and a unique pharmacological role of rapamycin as well. The mAb against human CD3 (UCHT1) was purchased from BD Pharmingen. 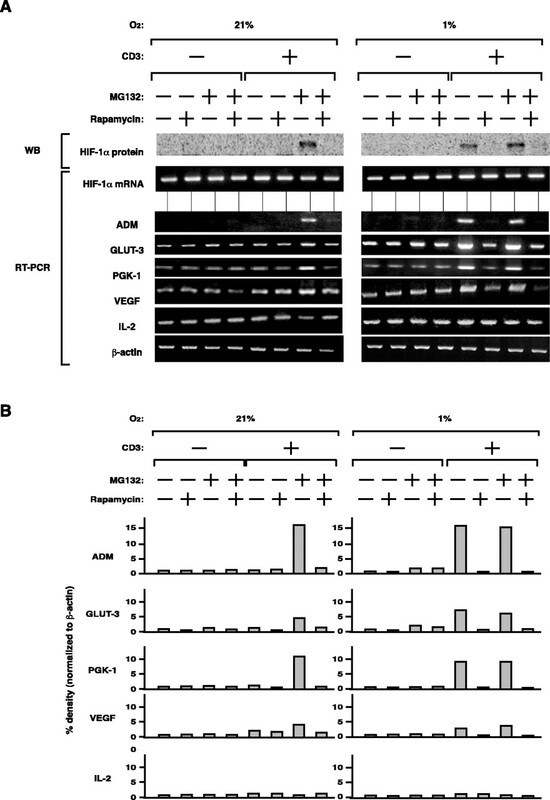 Anti-human HIF-1α (Ab463) and anti-human HIF-1β Abs were obtained from Abcam. 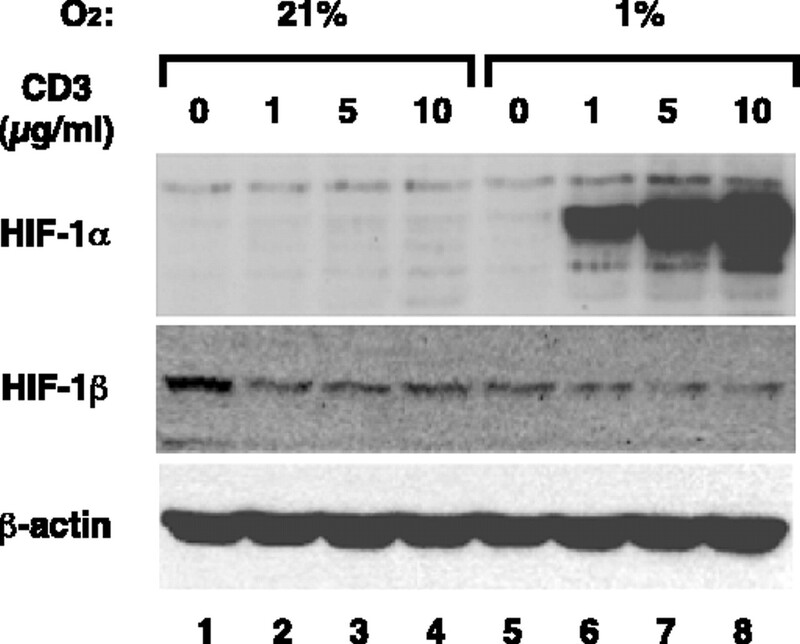 Abs against Akt and phosphorylated Akt at threonine 308 were purchased from Cell Signaling Technologies. Recombinant human IL-2 was obtained from PeproTech and PHA-M from Sigma-Aldrich. Other chemicals were purchased from Sigma-Aldrich unless otherwise specified. Fresh PBMC were prepared from heparinized blood of healthy volunteers by Ficoll-Paque Plus (Amersham Biosciences) density gradient centrifugation and suspended in RPMI 1640 medium (Sigma-Aldrich) supplemented with 10% FBS and antibiotics. Adherent cells were removed by incubation on plastic dishes for 1 h at 37°C, and the rest of the cells were separated on nylon wool columns to obtain T cell rich fraction. For activation, T cell blasts were generated by stimulation of the T cell fraction (1 × 106 cells/ml) with 5 μg/ml PHA-M for 48 h. The mitogen was then washed out, and the cells were maintained in the medium containing 10 ng/ml recombinant human IL-2. For additional experiments, the cells were washed three times with PBS and used as T cells in the present study. CD3 engagement of the cells (1 × 106 cells/ml) was performed in the presence of 10 ng/ml IL-2 on 6-well plates coated with anti-CD3 mAb (5 μg/ml), and exposure of the cells to various oxygen concentrations was conducted as described previously (22). Immunodetection of HIF-1α protein was performed as described previously (23). Briefly, whole cell extracts of T cells were prepared in lysis buffer consisting of 25 mM HEPES, 100 mM NaCl, 5 mM EDTA, 100 μM orthovanadate, and 0.5% Triton X-100, pH 7.9, followed by centrifugation at 14,000 rpm for 30 min at 4°C. Whole cell extract (60 μg) was separated with SDS-PAGE and electrically transferred onto polyvinylidene fluoride filters. The filters were incubated with anti-HIF-1α Ab at a dilution of 1:1000 in PBS containing 1% nonfat milk at 4°C overnight, followed by anti-mouse Ig-HRP conjugates (Amersham Biosciences) in the same buffer. Immunocomplexes were visualized using ECL as recommended by the manufacturer (Amersham Biosciences). Total RNA isolation from human peripheral T cells and Northern blot analysis were performed as described elsewhere (13). In brief, 2 × 107 T cells were stimulated with anti-CD3 Ab under normoxic or hypoxic conditions and harvested. Total RNA was isolated from T cells by guanidine isothiocyanate lysis/phenol chloroform extraction, followed by removal of contaminating DNA, and 10-μg aliquots of RNA were fractionated by electrophoresis in 1.5% agarose 2.2 M formaldehyde gels, transferred to Hybond N membranes (Amersham Biosciences), and hybridized with a 32P-labeled human HIF-1α cDNA probe. A total of 1 × 107 of T cells were incubated in a 6-well plate with or without 5 μg/ml anti-CD3 Ab. The cells were pretreated with or without MG132 in methionine-free RPMI 1640 medium. [35S]Methionine-cysteine was added to a final concentration of 0.3 mCi/ml, and the cells were pulse labeled for 30 min and then harvested. Whole cell extracts were prepared with RIPA buffer (50 mM Tris-HCl, 150 mM NaCl, 1 mM EDTA, 1% Triton X-100, 0.1% SDS, 0.1% sodium deoxycholate). Cell extract was precleared with protein A-Sepharose for 1 h. Anti-HIF-1α Ab was added to the supernatant and rotated overnight at 4°C. Twenty microliters of 50% slurry of protein A-Sepharose equilibrated with RIPA buffer was added to the mixture, rotated for 2 h at 4°C, pelleted and washed four times with RIPA buffer. Precipitated materials were eluted by boiling in SDS sample buffer. Samples were separated with SDS-PAGE, and the gel was vacuum dried and visualized by autoradiography. First strand cDNA was synthesized using 2 μg of DNase-treated total RNA as a template in 20 μl of reaction mixture containing 50 mM Tris-HCl (pH 8.3), 3 mM MgCl2, 10 mM DTT, 75 mM KCl, 1 mM dNTP, 0.1 mM oligo(dT) primer, and 50 U of Superscript II (Invitrogen Life Technologies) at 42°C for 50 min. PCR was conducted in a total volume of 30 μl in a mixture composed of 10 mM Tris-HCl (pH 8.3), 50 mM KCl, 1.5 mM MgCl2, 200 μM dNTP, 0.25 μM each of the sense and antisense primers, and 1 U of ExTaq DNA polymerase (TaKaRa). The amount of cDNA, as judged by the intensity of the amplified β-actin signal, was comparable among the preparations. Amplification by 27 cycles of 94°C for 30 s, 50°C for 30 s, and 72°C for 1 min was performed after 3 min of denaturing of the samples at 94°C and shown to be within linear range or non-saturated conditions for each primers amplification. Identities of the PCR products were confirmed by DNA sequencing. Primer pairs for amplification of each gene are as follows: HIF-1α, sense: 5′- CTGTGATGAGGCTTACCATCAGC-3′, antisense: 5′-CTCGGCTAGTTAGGGTACACTTC-3′; ADM, sense: 5′-GCGATCCGACTCACCAATAC-3′; antisense: 5′-TGGATCCTGAGTCGAAGTCT-3′; glucose transporter-1 (GLUT-1), sense: 5′-CTTTCTCCAGCCAGCAATGA-3′, antisense: 5′-TGGATCCTGAGTCGAAGTCT-3′; GLUT-3, sense: 5′-GATGCTGGAGAGGTTAAGGT-3′, antisense: 5′- ACTTCCACCCAGAGCAAAGT-3′; phosphoglycerate kinase-1 (PGK1), sense: 5′-CGAGCCAGCCAAAATAGAAGC-3′, antisense: 5′-TCAAACAGAGAAGTGCCAATC-3′; VEGF, sense: 5′-TGCCTTGCTGCTCTACCTCC-3′, antisense: 5′-TCACCGCCTCGGCTTGTCAC-3′; IL-2, sense: 5′-ATGTACAGGATGCAACTCCTGTCTT-3′; antisense: 5-AGCTGTTTCAGTTCTGTGGCCTTCT-3′; β-actin, sense: 5′-CCTCGCCTTTGCCGATCC-3′, antisense: 5′-GGATCTTCATGAGGTAGTCAGTC-3′. Jurkat T cell line stably expressing constitutive active form of HIF-1α or mock-DNA were grown to confluence in RPMI 1640 medium plus 10% FBS and other supplements. Cells were transfected with plasmid DNA containing promoter-reporter constructs by an electroporation method. Briefly, cells were washed twice with Opti-MEM (Invitrogen Life Technologies) and resuspended in the same medium at a concentration of 2 × 107 cells/ml. Cell suspension was placed in a electroporation cuvette (Gene Pulser; Bio-Rad) followed by adding 5 μg of HRE reporter plasmid DNA. The electroporation was conducted at a capacitance of 950 microfarads and 250 V. After electroporation, the cells were kept on ice for 10 min and resuspended in 10 ml of complete RPMI 1640 medium, and incubated for 12 h at 37°C in 5%. Then cells were further incubated for 36 h in either normoxic or hypoxic conditions. Luciferase enzyme activity was determined using a luminometer (Promega), and relative light units were normalized to the protein amount determined with BCA protein assay reagent according to the manufacturer’s instructions (Pierce). We first analyzed the effect of TCR-mediated signals on protein levels of HIF-1α in human peripheral T cells under hypoxic conditions. For that purpose, human peripheral T cells were treated with various doses of an immobilized mAb against CD3 under normoxic (21%) or hypoxic (1%) conditions and Western blot was performed to determine HIF-1α protein. Under normoxic condition, HIF-1α was not detected even in the presence of relatively high concentration of anti-CD3 mAb. However, under hypoxic condition, TCR/CD3 engagement up-regulated protein expression of HIF-1α in a concentration-dependent manner but did not that of HIF-1β (Fig. 1⇓). TCR engagement-mediated accumulation of HIF-1α protein expression in peripheral T cells. Human peripheral blood T cells were incubated in the absence or presence of increasing concentrations of immobilized anti-CD3 mAb (CD3) for 12 h under 21 or 1% oxygen concentration. Whole cell extracts were prepared and immunoblotting was performed with anti-HIF-1α, HIF-1β, and β-actin Abs as described in Materials and Methods. It has recently been reported that HIF-1α expression is regulated at multiple levels including stability/degradation, protein synthesis/translation, and transcription, by a distinct set of upstream signals, dependent on cells or tissues (see introduction). Therefore, we addressed at which level HIF-1α expression is regulated by TCR/CD3 ligation in peripheral blood T cells. Concerning protein stability/degradation, treatment of T cells with a proteasome inhibitor MG132 alone failed to restore HIF-1α protein, whereas that in combination with anti-CD3 stimulation successfully restored HIF-1α expression under normoxic condition. Combination of hypoxic treatment and TCR/CD3 ligation up-regulated HIF-1α expression to similar levels, and addition of MG132 did not further increase HIF-1α levels (Fig. 2⇓A). These results may indicate that TCR/CD3 engagement does not influence protein stability of HIF-1α and acts via a distinct mechanism concerning the increment of HIF-1α protein accumulation. Effect of CD3/TCR engagement on protein stability and steady-state level of mRNA of HIF-1α. A, Immunoblots for HIF-1α. Human peripheral blood T cells were cultured in the absence or presence of 5 μg/ml immobilized anti-CD3 mAb (CD3) or 5 μM MG132 for 12 h under 21 or 1% oxygen concentration as indicated. Protein levels of HIF-1α and β-actin were determined as described in Materials and Methods. B, Northern blot analysis for HIF-1α mRNA. Human peripheral blood T cells were cultured in the absence or presence of 5 μg/ml immobilized anti-CD3 mAb under 21 or 1% oxygen concentration for the indicated time periods. After isolation of total RNA, Northern blot for HIF-1α (top) or β-actin (middle) was performed as described in Materials and Methods. As a loading control, ethidium bromide-stained gel was presented in the bottom. Next we tested the effect of TCR ligation on the steady-state level of HIF-1α mRNA in peripheral blood T cells. T cells were stimulated with anti-CD3 mAb for the indicated time period under hypoxic conditions, and cellular contents of HIF-1α mRNA was determined using Northern blot analysis. Expression of HIF-1α mRNA appeared to be unaffected at any time point after application of anti-CD3 mAb (Fig. 2⇑B), indicating that alteration in steady-state level of HIF-1α mRNA is unlikely to be responsible for TCR ligation-mediated accumulation of HIF-1α protein in T cells under hypoxic conditions. Given these results, we examined a role of protein synthesis machinery. For that purpose, we first performed metabolic labeling analysis. Peripheral blood T cells were incubated with anti-CD3 mAb under normoxic conditions in the presence or absence of MG132 then pulse-labeled by means of [35S]methionine-cysteine incorporation followed by immunoprecipitation of HIF-1α. As shown in Fig. 3⇓A, 35S-incorporated HIF-1α was clearly detected not in the cells without stimulation but in those treated with anti-CD3 mAb in the presence of MG132 (Fig. 3⇓A), indicating that in addition to the inhibition of degradation, an up-regulation of HIF-1α protein synthesis by TCR ligation contributes to HIF-1α protein accumulation. To further confirm this issue, T cells were treated with anti-CD3 mAb in the presence of MG132 under normoxic conditions, then a protein synthesis inhibitor cycloheximide (CHX) was added and the culture was further continued for the indicated time period. HIF-1α protein levels were markedly decreased after addition of CHX, whereas T cells without CHX treatment showed persistent expression of HIF-1α for up to 6 h (Fig. 3⇓B). Decrease in HIF-1α protein level started as early as 60 min after treatment with CHX, and HIF-1α protein was hardly detectable after 4 h of treatment with CHX (Fig. 3⇓B). These results suggest that detectable HIF-1α protein accumulation requires continuous protein synthesis via CD3/TCR stimulation even when proteasomal degradation is inhibited either under hypoxic conditions or in the presence of MG132. TCR/CD3 engagement-dependent HIF-1α protein expression is regulated at the level of protein synthesis. A, Metabolic labeling analysis. Serum-starved human peripheral blood T cells were preincubated in the absence or presence of 5 μM MG132 or immobilized anti-CD3 Ab in methionine-free medium for 2 h under normoxic condition as indicated and pulse labeled with 0.3 mCi/ml [35S]methionine-cysteine for 30 min. After isolation of whole cell extracts, HIF-1α was affinity purified by immunoprecipitation and separated by 8% SDS-PAGE as described in Materials and Methods. The gel was dried and 35S-labeled HIF-1α protein was detected by autoradiography. B, Effect of a protein synthesis inhibitor CHX on HIF-1α protein expression. Human peripheral blood T cells were incubated for 12 h in the absence or presense of 5 μM MG132 and incubated in the presence (top panel) or absence (bottom panel) of 100 μM CHX for the indicated time periods. HIF-1α and β-actin were analyzed in immunoblots as described in Materials and Methods. Density of the bands was measured with NIH IMAGE 1.62 software being normalized to β-actin. Results are shown as relative density (percentage compared with the sample harvested after preincubation with MG132). Because it is shown that HIF-1α protein synthesis is up-regulated mainly via PI3K/mTOR pathway in, for example, cancer cells (see Introduction), we tested the possibility that TCR/CD3 ligation-mediated HIF-1α expression involves PI3K/mTOR pathway as well. For that purpose, we examined the effect of PI3K inhibitor wortmannin, comparing PKC inhibitor GF109203X. It is revealed that not GF109203X but wortmannin completely shuts down HIF-1α expression even under hypoxic condition (Fig. 4⇓A). To test the effect of oxygen concentration and TCR/CD3 ligation on PI3K activity, we determined the phosphorylated form of PI3K downstream target Akt. Fig. 4⇓B clearly demonstrates that TCR/CD3 ligation does not significantly alter protein levels of Akt but promotes its phosphorylation, and oxygen concentration does not affect the amount of either form of Akt. We next examined the effect of a specific mTOR inhibitor rapamycin on HIF-1α accumulation in peripheral blood T cells. 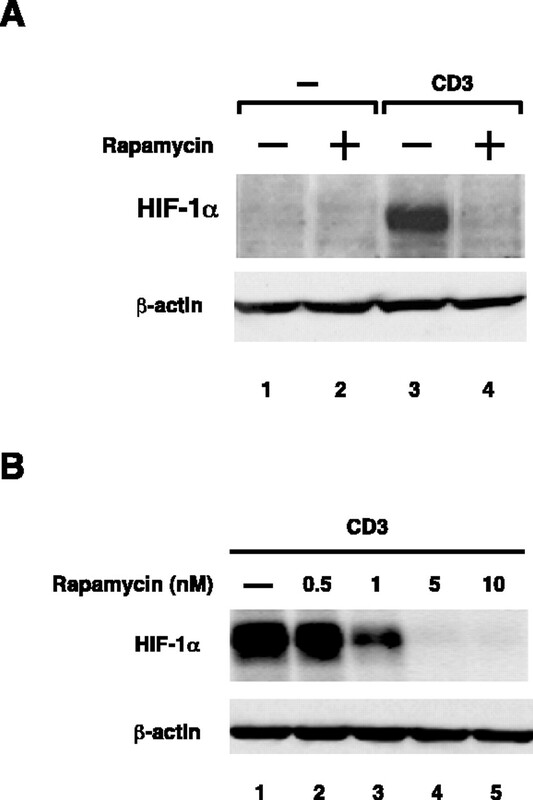 As anticipated, rapamycin completely inhibited the induction of HIF-1α protein expression in anti-CD3-stimulated T cells under hypoxic conditions (Fig. 5⇓A). The inhibitory effect of rapamycin was clearly shown to be concentration dependent (Fig. 5⇓B). Therefore, we may conclude that PI3K/mTOR is the major pathway that regulates HIF-1α protein synthesis in TCR-engaged T cells. Involvement of PI3K activation in TCR/CD3-dependent HIF-1α protein expression. A, Immunoblots for HIF-1α. Human peripheral blood T cells were incubated for 12 h in the absence or presence of 10 μM GF109203X (GX), 100 nM wortmannin (Wort), and immobilized anti-CD3 Ab (CD3). 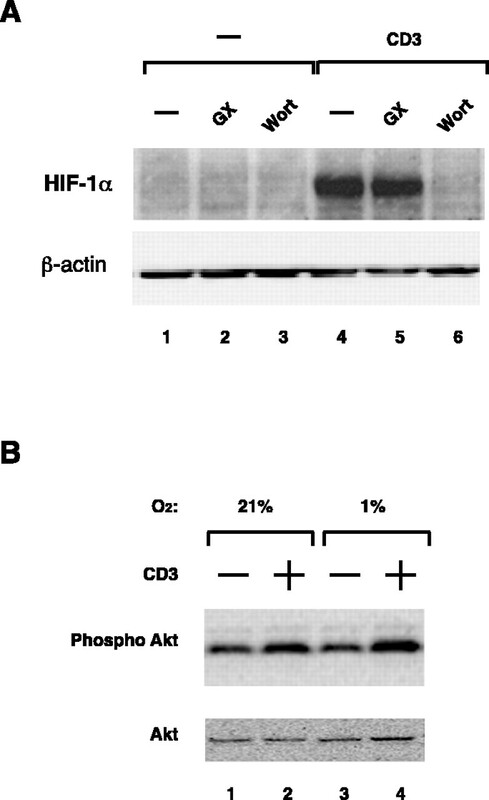 HIF-1α and β-actin proteins were detected in immunoblots as described in Materials and Methods. B, Akt phosphorylation. Human peripheral blood T cells were incubated for 12 h in the absence or presence of immobilized anti-CD3 mAb (CD3) under 21 or 1% oxygen concentration for 12 h. Thr308-phosphorylated form and total Akt protein was detected in immunoblots. Rapamycin inhibits TCR/CD3 engagement-dependent HIF-1α protein expression. Human peripheral blood T cells were incubated for 12 h in the absence or presence of various concentrations of rapamycin (10 nM in A, and 0.5, 1, 5, and 10 nM in B), or anti-CD3 mAb (CD3) under hypoxic conditions (1% O2), and HIF-1α or β-actin were detected in immunoblots. To examine the effect of rapamycin on mRNA expression of HIF-1 target genes, T cells were exposed to either hypoxia or normoxia in the absence or presence of anti-CD3 mAb, rapamycin, and MG132 as indicated; then total cellular RNA was prepared, and mRNA expression of HIF-1 target and non-target genes was determined using RT-PCR (Fig. 6⇓). Expression of HIF-1α mRNA was not significantly altered by either of these treatment. In contrast, expression profile of those HIF-1 target genes corresponded to that of HIF-1α protein. That is, combination of anti-CD3 mAb stimulation and either hypoxia or MG132 resulted in significant induction of ADM, GLUT-3, PGK1, VEGF mRNA expression, as well as a robust increase in HIF-1α protein expression. Induction of these mRNAs was inhibited by treatment with rapamycin in accordance with the disappearance of HIF-1α protein expression. Together, these results again indicate that TCR engagement-mediated up-regulation of HIF-1α accumulation and mRNA expression of HIF-1 target genes is rapamycin-sensitive and that protein levels of HIF-1α may, at least in part, determine the levels of mRNA expression of those genes. 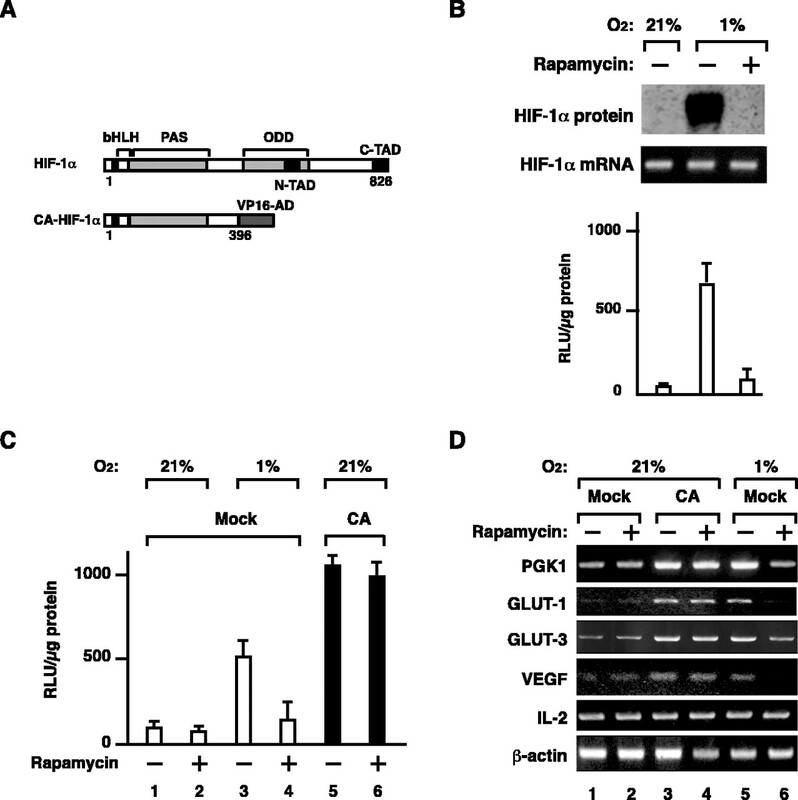 Effect of rapamycin on mRNA expression of HIF-1 target and non-target genes. Human peripheral blood T cells were cultured in the absence or presence of 5 μM MG132, 10 nM rapamycin, or 5 μg/ml immobilized anti-CD3 mAb under 21 or 1% oxygen concentration for 18 h. Protein levels of HIF-1α and mRNA levels of HIF-1α and HIF-1 target and non-target genes were determined in immunoblot and RT-PCR, respectively (A). Density of the bands was measured with NIH IMAGE 1.62 software being normalized to β-actin and shown in B. Results are shown as relative density (percentage compared with the sample without treatment (left) or treated with hypoxia alone (right)). We finally addressed the critical requirement of HIF-1α for mRNA expression of those HIF-1 target genes in the experiments with Jurkat cells that express constitutive active mutant of HIF-1α, CA-HIF-1α, which is a chimeric protein consisting of amino acid 1 to 396 of HIF-1α and VP-16 activation domain and escapes from oxygen-dependent degradation (Fig. 7⇓A). It should be noted that, in contrast to peripheral blood T cells, hypoxic treatment is sufficient for protein expression of HIF-1α and correspondent HRE-driven reporter gene activation in parent Jurkat cells (Fig. 7⇓B). Because either treatment with rapamycin (Fig. 7⇓B) or serum starvation (data not shown) diminished HIF-1α expression under hypoxic conditions, it is strongly indicated that serum factors are sufficient for protein synthesis of HIF-1α in Jurkat cells in the absence of CD3 engagement as seen in many cancer cells (see introduction). Therefore, to minimize the effect of endogenous HIF-1α, we tested the effect of rapamycin in CA-HIF-1α expressing Jurkat cells under not hypoxic but normoxic conditions (Fig. 7⇓B). CA-HIF-1α expressing Jurkat cells showed constitutive activation of the reporter gene expression under normoxic conditions by approximately 2-fold when compared with hypoxic parental or mock-transfected Jurkat cells, confirming that CA-HIF-1α bypassed oxygen-dependent degradation and acted as a constitutive transcriptional activator (Fig. 7⇓, B and C). The constitutive activation of the reporter gene expression in those cells was not suppressed by rapamycin (Fig. 7⇓C), indicating that constitutive active HIF-1α could bypass the inhibitory effect of rapamycin and rapamycin effects upstream of HIF-1α. Moreover, this issue was also reflected in mRNA expression profile of HIF-1α target genes. As shown in Fig. 7⇓D, mRNA expression of HIF-1 target genes, PGK1, GLUT-1, GLUT-3, and VEGF in mock-transfected Jurkat cells was increased under hypoxic conditions (lanes 1 and 5), and markedly decreased in the presence of rapamycin again as in the case of peripheral blood T cells (lanes 5 and 6). In contrast, IL-2 mRNA expression was not significantly influenced in either mock-transfected or CA-HIF1 Jurkat cells. Expression of HIF-1 target genes was increased in CA-HIF-1α expressing Jurkat cells even in normoxic conditions, and the suppressive effect of rapamycin was not observed (lanes 3 and 4). Therefore, we may conclude that accumulation of HIF-1α protein in peripheral blood T cells is controlled by dual mechanisms: oxygen-dependent degradation and TCR-mediated synthesis involving PI3K/mTOR, and rapamycin inhibits HIF-1 target gene expression via suppression of HIF-1α synthesis. Rapamycin acts at the level of protein synthesis of HIF-1α. A, Schematic representation of the primary structure of the wild-type HIF-1α and CA-HIF-1α. bHLH, basic helix-loop-helix; PAS, Per/Arnt/Sim homology domain; ODD, oxygen-dependent degradation domain; N-TAD, N-terminal transactivation domain; C-TAD, C-terminal transactivation domain; VP16 AD, VP16 transactivation domain. Numbers depict positions of amino acids. B, Hypoxia is sufficient for HIF-1α protein expression in Jurkat cells. Jurkat cells were transfected with HRE luciferase reporter plasmids and cultured under normoxic or hypoxic condition in the presence or absence of rapamycin for 12 h; then whole cell extracts and total RNA were subjected to immunoblots for HIF-1α, luciferase assay, and RT-PCR analysis. Results of luciferase reporter gene assay were shown as relative light units (RLU) normalized to protein content and means ± SD from at least three independent experiments are presented (see Materials and Methods). C, CA-HIF-1α, bypassing oxygen-dependent degradation, acted as a constitutive transactivator. Mock-transfected (Mock) and CA-HIF-1α-transfected Jurkat cells (CA) were transfected with the HRE luciferase reporter gene and cultured in the presence or absence of 10 nM rapamycin under 21 or 1% oxygen concentration for 24 h. Cells were harvested and luciferase activity was measured. Results were shown as relative light units (RLU) normalized to protein content and means ± SD from at least three independent experiments are presented. D, Effect of rapamycin on mRNA expression of HIF-1 target genes in mock- and CA-HIF-1α-transfected Jurkat cells. Mock-transfected (Mock) and CA-HIF-1α-transfected Jurkat cells (CA) were cultured in the presence or absence of 10 nM rapamycin under 21 or 1% oxygen concentration for 24 h. Total RNA was prepared and RT-PCR analysis was performed to monitor mRNA expression of the indicated HIF-1 target genes (PGK,GLUT-1,GLUT-3,VEGF,) or non-HIF-1 target genes (IL-2, β-actin). In this study, we suggested that hypoxia and TCR-mediated signal have distinct roles for HIF-1α expression in peripheral blood T cells; hypoxia prevents HIF-1α protein degradation as seen in many cells, whereas TCR-mediated signal increases expression of HIF-1α protein, most possibly via enhancement of protein synthesis. TCR ligation, either with or without CD28 engagement, stimulate PI3K followed by activation of its downstream signals including Akt (24, 25). Together with the fact that PI3K inhibitor wortmannin blocks anti-CD3-mediated HIF-1α expression, it is indicated that activation of PI3K is prerequisite for HIF-1α expression after TCR/CD3 ligation. Moreover, TCR/CD3 ligation increases HIF-1 target genes including glucose transporters and PGK1, which may be essential for supporting energy metabolisms in T cells under hypoxic conditions (26). The Pasteur effect is believed to be the most ancient metabolic adaptation to hypoxia in cells, including decreased oxidative phosphorylation and an increase in anaerobic fermentation (27, 28, 29). Because anaerobic fermentation produces far less ATP than oxidative phosphorylation per molecule of glucose, increased activity of the glycolytic pathway is necessary to maintain free ATP levels in the hypoxic cell (28). It has already been reported that HIF-1α and its target genes essentially control the metabolic state and maintain cellular ATP levels via glycolysis during hypoxia (30). Interestingly, Frauwirth et al. (31) reported that, CD3/CD28-mediated activation of PI3K has a distinct role in T cell function, regulating glucose uptake and glycolysis via enhanced expression of, for example, GLUT-1. PI3K activation after ligation of CD3 or CD3/CD28 may, therefore, converge onto the stage of protein translation of HIF-1α to potentiate protein expression of HIF-1α and maintenance of cellular ATP levels and metabolic conditions under hypoxic conditions in situ. Indeed, we have also confirmed that CD3 engagement-mediated increase in HIF-1α expression is further amplified by costimulation via CD28 (data not shown). Collectively, it should be emphasized that TCR signaling diverges into conventionally studied pathways including IL-2 production, and HIF-1-mediated metabolic adaptation, the latter of which is considered to be targeted by rapamycin. Selective up-regulation of alternatively spliced mRNA isoform of HIF-1α was seen in Ag receptor-activated mice T cells (32). However, this is not the case in human peripheral blood T cells (22). Moreover, it is reported that, in monocyte/macrophage, lipopolysaccharides enhance HIF-1α expression via increased expression of HIF-1α mRNA (15). Hudson et al. (33) showed that rapamycin interferes with HIF-1α activation in hypoxic PC-3 cells by increasing the rate of HIF-1α degradation. Collectively, HIF-1α protein expression might be regulated via distinct mechanisms or pathways in each species, tissue or cell in a spatial- and signal-dependent manner, enabling their rationale adaptation. Recently, involvement of PI3K/mTOR pathway in HIF-1α synthesis has been described in many cancers. In addition, rapamycin is shown to repress HIF-1α synthesis and expression of HIF-1 target genes including VEGF in these cells via targeting mTOR. Therefore, rapamycin is now considered to act as an antineoplastic agent, as well as an immunosuppressant (18, 34). It appears to be obvious to hypothesize that rapamycin suppresses HIF-1α protein expression in T cells as well. Indeed, we clearly showed that rapamycin dose-dependently decreased HIF-1α expression in CD3-engaged T cells under hypoxic conditions. Moreover, we have shown that rapamycin represses mRNA expression of HIF-1 target genes including PGK1, and GLUTs, which serve as key molecules for glycolysis, as well as that of VEGF. It should be noted that mRNA expression of, for example, IL-2 was reported not to be susceptible to treatment with rapamycin (35). Since the promoter region of the IL-2 gene does not contain HRE, we may conclude that rapamycin rather selectively targets HRE-containing genes and elicits distinct immunosuppression via, at least in part, repression of HIF-1-dependent gene expression (35). HIF-1α has been shown to be expressed in various inflammatory diseases including Crohn’s disease (36), ulcerative colitis (36), and rheumatoid arthritis (22, 37, 38), and expression of those genes is critical for adequate immune response in T cells (see Introduction). TCR-driven activation of PI3K/mTOR and HIF-1α synthesis could be an interesting target for immune modulation, and rapamycin could be one of the exploratory drugs attacking this pathway. On the other hand, classic cytotoxic drugs may have increased risk of secondary neoplasms (39, 40, 41). Considering that rapamycin may operate as an antineoplastic agent via, for example, inhibition of VEGF expression in various cancers, it is indicated that rapamycin and its analogues constitute a unique class of immunosuppressive agents from the viewpoint of not only its mechanism of actions but also distinct clinical benefit. We are grateful to all the members of the Morimoto laboratory for fruitful discussion. ↵1 This work was supported in part by grants from the Ministry of Education, Science, Technology, Sports and Culture, the Ministry of Health, Labor, and Welfare of Japan, the Takeda Science Foundation, the Uehara Memorial Foundation, the Vehicle Racing Commemorative Foundation, Novartis Foundation, and the Cell Science Research Foundation. ↵3 Abbreviations used in this paper: HIF-1, hypoxia-inducible factor-1; VEGF, vascular endothelial growth factors; HRE, hypoxia response element; mTOR, mammalian target of rapamycin; ADM, adrenomedullin; GLUT, glucose transporter; PGK1, phosphoglycerate kinase-1; CHX, cycloheximide. Westermann, J., U. Bode. 1999. Distribution of activated T cells migrating through the body: a matter of life and death. Immunol. Today 20: 302-306. Vaupel, P., O. Thews, D. K. Kelleher, M. Hoeckel. 1998. Current status of knowledge and critical issues in tumor oxygenation: results from 25 years research in tumor pathophysiology. Adv. Exp. Med. Biol. 454: 591-602. Krauss, S., M. D. Brand, F. Buttgereit. 2001. Signaling takes a breath–new quantitative perspectives on bioenergetics and signal transduction. Immunity 15: 497-502. Semenza, G. L.. 2004. Hydroxylation of HIF-1: oxygen sensing at the molecular level. Physiology (Bethesda) 19: 176-182. Poellinger, L., R. S. Johnson. 2004. HIF-1 and hypoxic response: the plot thickens. Curr. Opin. Genet. Dev. 14: 81-85. Kojima, H., H. Gu, S. Nomura, C. C. Caldwell, T. Kobata, P. Carmeliet, G. L. Semenza, M. V. Sitkovsky. 2002. Abnormal B lymphocyte development and autoimmunity in hypoxia-inducible factor 1α-deficient chimeric mice. Proc. Natl. Acad. Sci. USA 99: 2170-2174. Cramer, T., Y. Yamanishi, B. E. Clausen, I. Forster, R. Pawlinski, N. Mackman, V. H. Haase, R. Jaenisch, M. Corr, V. Nizet, et al 2003. HIF-1α is essential for myeloid cell-mediated inflammation. Cell 112: 645-657. Schofield, C. J., P. J. Ratcliffe. 2004. Oxygen sensing by HIF hydroxylases. Nat. Rev. Mol. Cell Biol. 5: 343-354. Zelzer, E., Y. Levy, C. Kahana, B. Z. Shilo, M. Rubinstein, B. Cohen. 1998. Insulin induces transcription of target genes through the hypoxia-inducible factor HIF-1α/ARNT. EMBO J. 17: 5085-5094. Bilton, R. L., G. W. Booker. 2003. The subtle side to hypoxia inducible factor (HIFα) regulation. Eur. J. Biochem. 270: 791-798. Zhong, H., K. Chiles, D. Feldser, E. Laughner, C. Hanrahan, M. M. Georgescu, J. W. Simons, G. L. Semenza. 2000. Modulation of hypoxia-inducible factor 1α expression by the epidermal growth factor/phosphatidylinositol 3-kinase/PTEN/AKT/FRAP pathway in human prostate cancer cells: implications for tumor angiogenesis and therapeutics. Cancer Res. 60: 1541-1545. Laughner, E., P. Taghavi, K. Chiles, P. C. Mahon, G. L. Semenza. 2001. HER2 (neu) signaling increases the rate of hypoxia-inducible factor 1α (HIF-1α) synthesis: novel mechanism for HIF-1-mediated vascular endothelial growth factor expression. Mol. Cell Biol. 21: 3995-4004. Fukuda, R., K. Hirota, F. Fan, Y. D. Jung, L. M. Ellis, G. L. Semenza. 2002. Insulin-like growth factor 1 induces hypoxia-inducible factor 1-mediated vascular endothelial growth factor expression, which is dependent on MAP kinase and phosphatidylinositol 3-kinase signaling in colon cancer cells. J. Biol. Chem. 277: 38205-38211. Alam, H., E. T. Maizels, Y. Park, S. Ghaey, Z. J. Feiger, N. S. Chandel, M. Hunzicker-Dunn. 2004. Follicle-stimulating hormone activation of hypoxia-inducible factor-1 by the phosphatidylinositol 3-kinase/AKT/Ras homolog enriched in brain (Rheb)/mammalian target of rapamycin (mTOR) pathway is necessary for induction of select protein markers of follicular differentiation. J. Biol. Chem. 279: 19431-19440. Blouin, C. C., E. L. Page, G. M. Soucy, D. E. Richard. 2004. Hypoxic gene activation by lipopolysaccharide in macrophages: implication of hypoxia-inducible factor 1α. Blood 103: 1124-1130. Masri, M. A.. 2003. The mosaic of immunosuppressive drugs. Mol. Immunol. 39: 1073-1080. Hay, N., N. Sonenberg. 2004. Upstream and downstream of mTOR. Genes Dev. 18: 1926-1945. Guba, M., C. Graeb, K. W. Jauch, E. K. Geissler. 2004. Pro- and anti-cancer effects of immunosuppressive agents used in organ transplantation. Transplantation 77: 1777-1782. Huang, S., P. J. Houghton. 2003. Targeting mTOR signaling for cancer therapy. Curr. Opin. Pharmacol. 3: 371-377. Guba, M., P. von Breitenbuch, M. Steinbauer, G. Koehl, S. Flegel, M. Hornung, C. J. Bruns, C. Zuelke, S. Farkas, M. Anthuber, et al 2002. Rapamycin inhibits primary and metastatic tumor growth by antiangiogenesis: involvement of vascular endothelial growth factor. Nat. Med. 8: 128-135. Majumder, P. K., P. G. Febbo, R. Bikoff, R. Berger, Q. Xue, L. M. McMahon, J. Manola, J. Brugarolas, T. J. McDonnell, T. R. Golub, et al 2004. mTOR inhibition reverses Akt-dependent prostate intraepithelial neoplasia through regulation of apoptotic and HIF-1-dependent pathways. Nat. Med. 10: 594-601. Makino, Y., H. Nakamura, E. Ikeda, K. Ohnuma, K. Yamauchi, Y. Yabe, L. Poellinger, Y. Okada, C. Morimoto, H. Tanaka. 2003. Hypoxia-inducible factor regulates survival of antigen receptor-driven T cells. J. Immunol. 171: 6534-6540. Kodama, T., N. Shimizu, N. Yoshikawa, Y. Makino, R. Ouchida, K. Okamoto, T. Hisada, H. Nakamura, C. Morimoto, H. Tanaka. 2003. Role of the glucocorticoid receptor for regulation of hypoxia-dependent gene expression. J. Biol. Chem. 278: 33384-33391. Okkenhaug, K., B. B. Vanhaesebroeck. 2003. PI3K in lymphocyte development, differentiation and activation. Nat. Rev. Immunol. 3: 317-330. Ward, S. G., D. A. Cantrell. 2001. Phosphoinositide 3-kinases in T lymphocyte activation. Curr. Opin. Immunol. 13: 332-338. MacDonald, H. R., C. J. Koch. 1977. Energy metabolism and T-cell-mediated cytolysis. I. Synergism between inhibitors of respiration and glycolysis. J. Exp. Med. 146: 698-709. Pasteur, L.. 1861. Experience et vues nouvelles sur la nature des fermentations. Comp. Rend. Acad. Sci. 52: 1260. Stryer, L.. 1995. Biochemistry 4th ed , New York. .
Hardie, D. G.. 2000. Metabolic control: a new solution to an old problem. Curr. Biol. 10: R757-R759. Seagroves, T. N., H. E. Ryan, H. Lu, B. G. Wouters, M. Knapp, P. Thibault, K. Laderoute, R. S. Johnson. 2001. 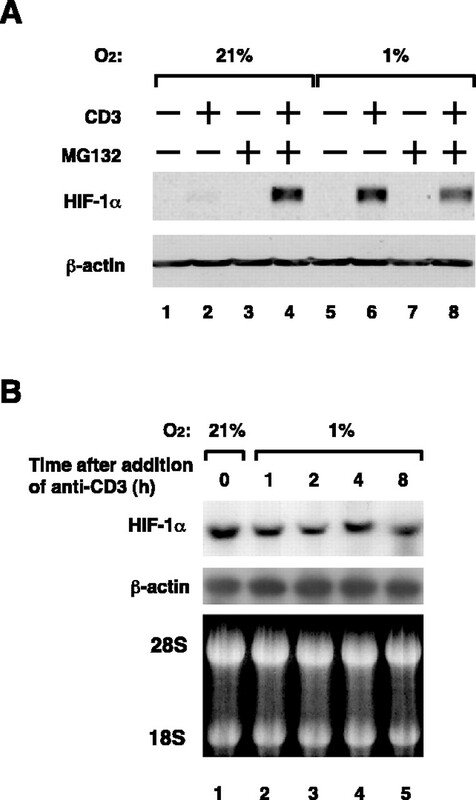 Transcription factor HIF-1 is a necessary mediator of the pasteur effect in mammalian cells. Mol. Cell Biol. 21: 3436-3444. Frauwirth, K. A., J. L. Riley, M. H. Harris, R. V. Parry, J. C. Rathmell, D. R. Plas, R. L. Elstrom, C. H. June, C. B. Thompson. 2002. The CD28 signaling pathway regulates glucose metabolism. Immunity 16: 769-777. Lukashev, D., C. Caldwell, A. Ohta, P. Chen, M. Sitkovsky. 2001. Differential regulation of two alternatively spliced isoforms of hypoxia-inducible factor-1α in activated T lymphocytes. J. Biol. Chem. 276: 48754-48763. Hudson, C. C., M. Liu, G. G. Chiang, D. M. Otterness, D. C. Loomis, F. Kaper, A. J. Giaccia, R. T. Abraham. 2002. Regulation of hypoxia-inducible factor 1α expression and function by the mammalian target of rapamycin. Mol. Cell Biol. 22: 7004-7014. Hidalgo, M., E. K. Rowinsky. 2000. The rapamycin-sensitive signal transduction pathway as a target for cancer therapy. Oncogene 19: 6680-6686. Matsue, H., C. Yang, K. Matsue, D. Edelbaum, M. Mummert, A. Takashima. 2002. Contrasting impacts of immunosuppressive agents (rapamycin, FK506, cyclosporin A, and dexamethasone) on bidirectional dendritic cell-T cell interaction during antigen presentation. J. Immunol. 169: 3555-3564. Giatromanolaki, A., E. Sivridis, E. Maltezos, D. Papazoglou, C. Simopoulos, K. C. Gatter, A. L. Harris, M. I. Koukourakis. 2003. Hypoxia inducible factor 1α and 2α overexpression in inflammatory bowel disease. J. Clin. Pathol. 56: 209-213. Giatromanolaki, A., E. Sivridis, E. Maltezos, N. Athanassou, D. Papazoglou, K. C. Gatter, A. L. Harris, M. I. Koukourakis. 2003. Upregulated hypoxia inducible factor-1alpha and -2alpha pathway in rheumatoid arthritis and osteoarthritis. Arthritis Res. Ther. 5: R193-R201. Hollander, A. P., K. P. Corke, A. J. Freemont, C. E. Lewis. 2001. Expression of hypoxia-inducible factor 1α by macrophages in the rheumatoid synovium: implications for targeting of therapeutic genes to the inflamed joint. Arthritis Rheum. 44: 1540-1544. Penn, I.. 1998. Occurrence of cancers in immunosuppressed organ transplant recipients. Clin. Transpl. 1998: 147-158. Garver, R. I., Jr, G. L. Zorn, X. Wu, D. C. McGiffin, K. R. Young, Jr, N. B. Pinkard. 1999. Recurrence of bronchioloalveolar carcinoma in transplanted lungs. N. Engl. J. Med. 340: 1071-1074. Euvrard, S., C. Ulrich, N. Lefrancois. 2004. Immunosuppressants and skin cancer in transplant patients: focus on rapamycin. Dermatol. Surg. 30: 628-633.